Kindness has always been a core principle of Freemasonry. Individuals give time and money to help others, whether locally, nationally or globally. It may be making donations to other UK charities or responding to an international disaster appeal. Nationally Freemasons are one of the UK’s top charities raising over £33 million a year and one of its main grant-giving bodies. 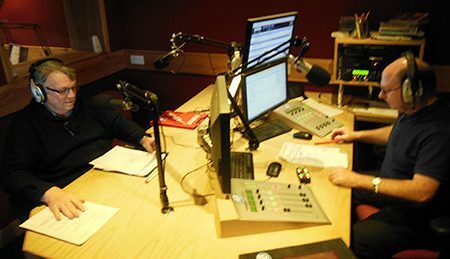 On the morning of Sunday 13th Jan. 2019, Ian Kingsbury (Provincial Grand Master of Devonshire), accompanied by Clive Eden (Provincial Press Officer) was interviewed by local radio presenter Howard James, on Exmouth Air. For 30 minutes of the 2 hour radio show, many aspects of Freemasonry were openly explained and candidly answered. A very frank and open discussion of Freemasonry took place, and credit to those involved. On 28th November 2018, Sun Lodge No. 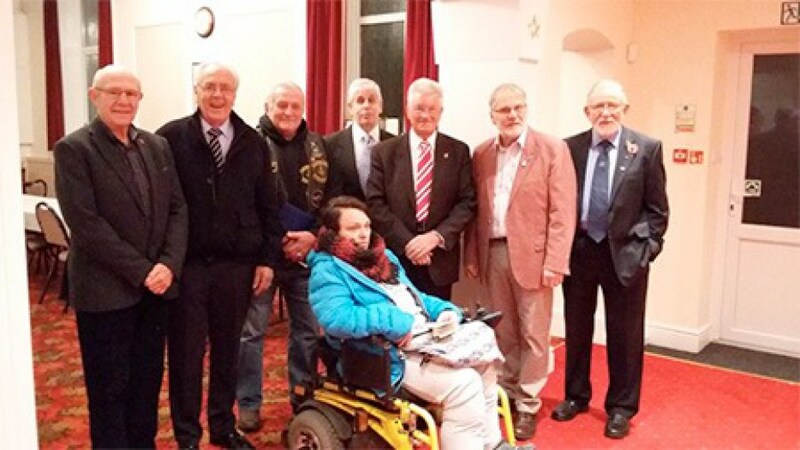 106 Masonic Charities Association held its presentation evening for Non Masonic Charities and Organisations. 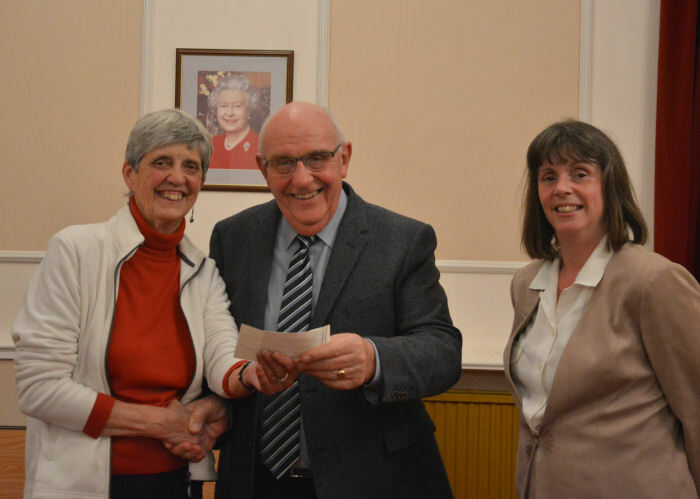 The presentation evening which is in its 13th year saw £2,350 presented to ten organisations. Photo’s of just some of the recipients, during the presentation evening. Exmouth Journal reporter Joseph Bulmer was given a guided tour of the building by the county’s Provincial Grand Master Ian Kingsbury. The Masonic Hall on St. Andrews Road was opened in 1894, first used by The Sun Lodge who where established in 1759, and regularly sees gatherings of up to 140 people, with an estimated 2,000 people using or visiting the building each year. See full article in the Exmouth Journal. “I think men, especially younger men, see us as an upstanding organisation that enjoys doing good work. We like to show people that they can lead a good life, personally, in business and in society at large, plus we have a lot of fun raising money for charity. Several Masonic lodges use Exmouth’s Masonic Hall, including the Per Mare Per Terram Lodge No. 9355 for Royal Marines. 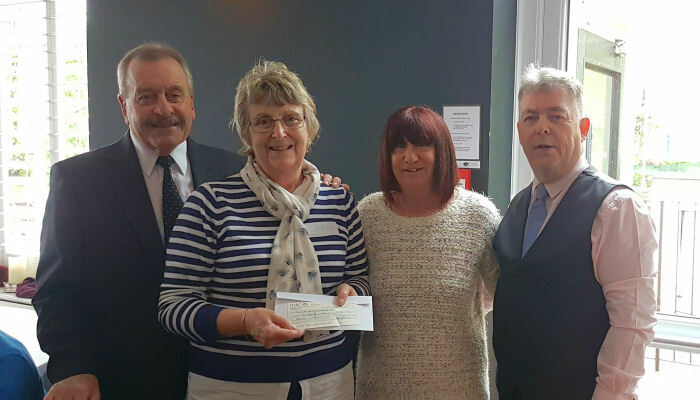 Charity work is central to Freemasonry and the Exmouth’s members have raised more than £8,000 in the last year, contributed to the town’s library, provided a wheelchair to a young girl suffering form cerebral palsy and donated £3,000 to Exmouth Hospital for a patient hoist. 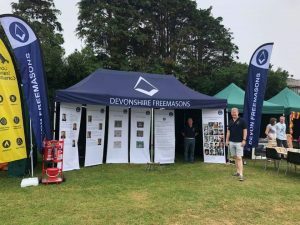 During the 2018 Exmouth Festival held at the Recreation Ground, the Provincial Membership Team was present with its splendid new stand (pictured), for 3 days inclusive, from Saturday 26th May until Monday 28th May. The event followed several already attended by the Provincial Team during the 2018 show season. So far this year the Team have spoken to 417 people promoting Freemasonry, (although this number will go up when the number is received from the History festival event in Plymouth). Many interesting question where asked about Freemasonry. The Team was able to speak openly and honestly to give both informed and useful answers. As well as communicate the values, attractions and contributions of Freemasonry. 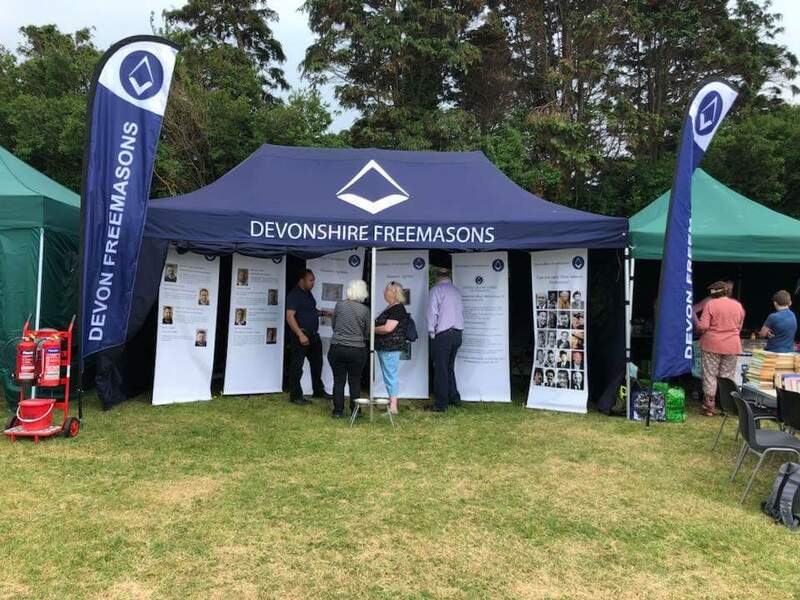 Some visitors to the Festival, came to the stand, just to say hello as they had family connections to Freemasonry, or where Freemasons on holiday in the area. Overall the Team received a number of approaches for information on joining Freemasonry from Plymouth, Exmouth, East Devon and Dawlish. These potential candidates will now start the 12 months process of joining (should they be suitable and finally agree to make the commitment needed). The Plymouth Team were W.Bro’s Cotter and Hornibrook and Bro. Herd. The Exmouth Team were W.Bro’s Taylor, Sidwell, Oliver, Lewis and Bro. Chundee. They were supported by W.Bro. Robshaw, Sun Lodge and W.Bro. 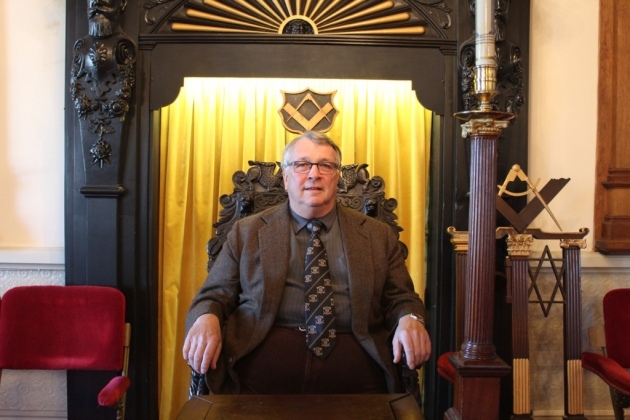 Jim Orridge, The Lodge of Harmony. So if you happen to be at any of these other events, pop in and speak to the Team. Worshipful Master Ian Matthews his wife Debbie, and W.Bro. Tony Howe as Treasurer of the Sun Lodge Ladies Night committee presented a cheque for £140 to Jean Honey a founder of Exmouth Memory Cafe. The Memory Cafe in Exmouth is open to anyone worried about their memory, worried about someone else’s memory or affected by dementia. 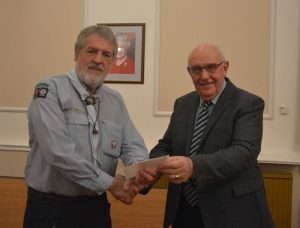 Proceeds were raised from the Draw held at the Sun Lodge No. 106 Ladies Night, held at the Royal Beacon Hotel on 24th March 2018. Left to right, Tony Howe, Jean Honey, Debbie Matthews, Ian Matthews. Sun Lodge No. 106 at their regular meeting, welcomed the Worshipful Master, Worshipful Brother John Holman, and the Brethren of the Tennyson Lodge No. 4947 which meets in Clevedon in the Province of Somerset. The association between Sun Lodge and the Holman family commenced on the 8th September 1952 when Mr Albert Edward Holman (Grandfather of Worshipful Brother John), a retired police officer aged 54 years residing at 16 Seymour Road Exmouth was initiated into Sun Lodge having been proposed by Worshipful Brother W.H. Kennard and seconded by Worshipful Brother J.H. Gorfin. On the 11th April 1960 when Mr Edward William Holman (Father of Worshipful Brother John) a post office engineer residing at 57 Roseway Littleham Exmouth was initiated into Sun Lodge having been proposed by his father Brother A.E. Holman and seconded by Worshipful Brother J.H. Gorfin. On the 8th March 1965 when Mr John Albert Holman (Uncle of Worshipful Brother John) a police constable aged 33 years residing at 45 Roseland Avenue Heavitree Exeter was initiated into Sun Lodge having been proposed by his father Brother A.E. Holman and seconded by Worshipful Brother J.H. Gorfin. Worshipful Brother Ted (Father of Worshipful Brother John) was installed as Worshipful Master of Sun Lodge on 10th January 1972. The Lodge was opened in the 2nd Degree and Brother E.W. Holman, Master Elect, was presented by his father, Brother A.E. Holman. 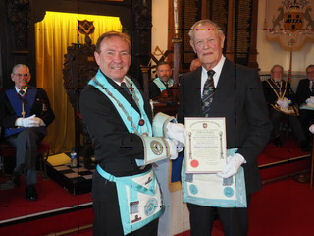 Later in the ceremony Brother Albert presented the 2nd Degree Working Tools to his son Worshipful Brother Ted. Worshipful Brother John has visited Sun Lodge on previous occasions with his uncle Brother Jack but on Monday 9th April 2018, Sun Lodge welcomed him again, but this time as Worshipful Master and congratulated him on attaining the Chair of Tennyson Lodge No. 4947. 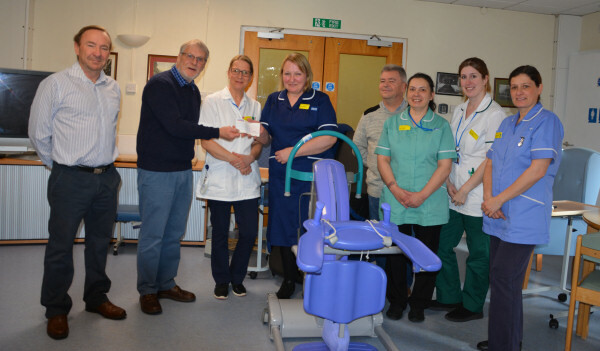 A cheque for £3,000 from the Exmouth Freemasons was presented to the Exmouth Hospital on Tuesday 13th February 2018 to purchase a mobile patient hoist. The Worshipful Masters of the Per Mare Per Terram Lodge 9355 (T Devin), Sun Lodge 106 (Ian Matthews) & The Rolle Lodge 2759 (Peter O’Connor) were present. 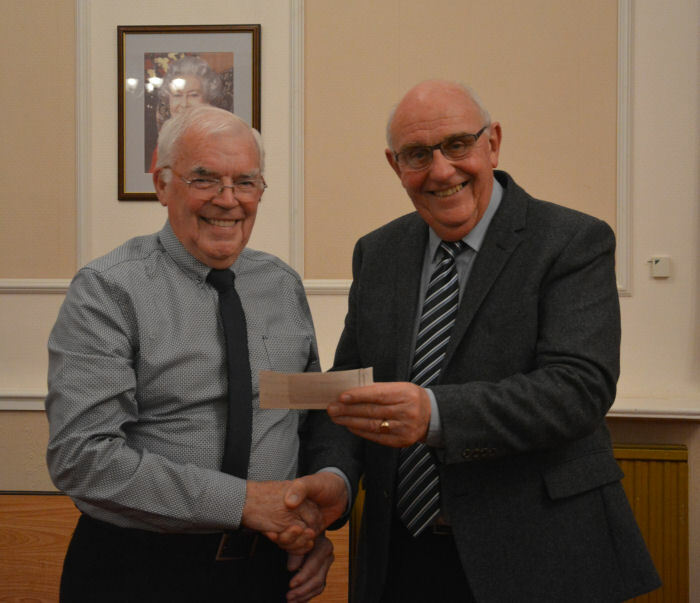 The amount was raised from small change placed in the “Hospital Box” which is passed around at festive boards at all the Freemasons lodges in Exmouth over the past 5 years. Andrea is a resident of Exmouth who lives with cerebral palsy. Her mobility is extremely limited and she depends completely on an electric wheelchair. She has two, neither of which are fit for purpose, and the engineer who looks after them has told her that they are both beyond any meaningful repair and a replacement is the only option. He has recommended an American chair, purpose built for her needs. It is, however, very expensive, but as she suffers from other debilitating conditions this is the one recommended for her very specialised needs – not just a luxury item. Andrea can’t afford that so a charity appeal was launched to try and raise the funds. The Freemasons of Exmouth and Budleigh Salterton, both in the Craft and the Royal Arch have come together and made a huge contribution towards the chair. It started with £100 from the Widows Sons SW Motorcycle Association and rapidly grew with donations from the following Lodges and Chapters. This was followed by a very generous donation of £1,500 by the Provincial Grand Superintendent, E Comp Simon Rowe. Other Masons have made personal donations to raise a total of £3,300 for this worthy cause. Andrea is now well on the way to the total needed. 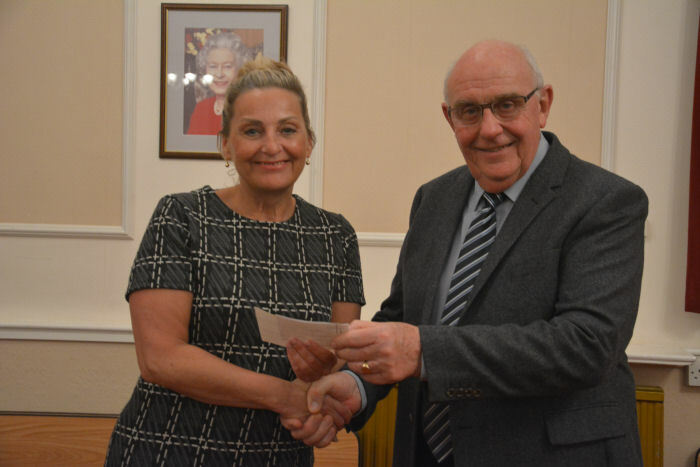 The Freemasons of Exmouth and Budleigh Salterton have demonstrated once again that charity is one of the leading lights of Freemasonry in helping this lady to become mobile again. 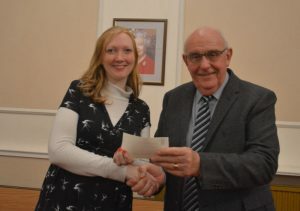 Andrea was invited to the Exmouth Lodge building on Friday 10 November to receive the cheques. Andrea sends her sincere thanks to all the Lodges and Chapters and all others who have contributed. She has promised to visit us and show us the new chair when it arrives. We all wish her the best of luck. 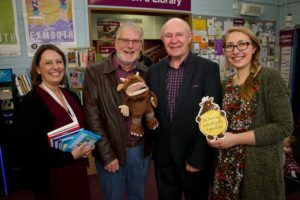 After a fundraising effort by Friends of Exmouth Library and a donation from the Exmouth Freemasons, the library was able to make some improvements to the area dedicated to Exmouth’s younger generation. Sun Lodge No 106 Masonic Charities Association recently held its presentation evening for Non Masonic Charities and Organisations. 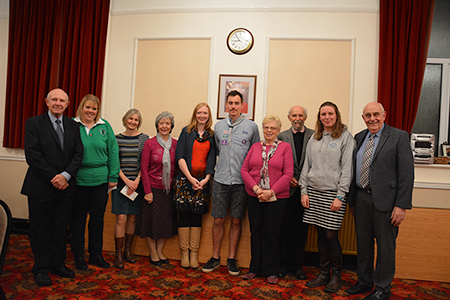 The presentation evening which is in its twelfth year saw £2,200 presented to nine organisations. The Royal Marines and the Royal Navy were already well established when Freemasonry was born, and over the past three centuries have provided fellowship and a watering hole for countless sailors and marines all around the Globe. All three of the Lodges in Exmouth are blessed with former Royal Marines as members, with the majority of those being Members of Per Mare Per Terram Lodge. Within Per Mare Per Terram there are several Members still serving in the Royal Marines, and indeed our next ceremony in December will see a further addition as the candidate is a serving Warrant Officer. With the three Exmouth Lodges all having former Royal Marines as members, it creates a bond between these Lodges and goes some to explaining why an evening spent at any of the three is such a pleasant experience as the banter can only be described as witty and constant if totally harmless. 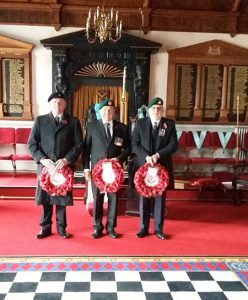 At the Remembrance Day parade on Sunday 12th November the three Freemason’s Lodges in Exmouth were represented by their Worshipful Masters for the wreath laying ceremony. The wreath donated by Sun Lodge No.106 was laid by W. Bro Simon Skinner formerly a Leading Seaman in the Royal Navy. The wreath for the Rolle Lodge No.2759 was laid by W. Bro Peter O’Connor, formerly a Warrant Officer 1 (Helicopter Pilot) Royal Marines. And the wreath for the Per Mare Per Terram Lodge No.9355 was laid by W. Bro Tom Devin, formerly a Warrant Officer 2 (Platoon Weapons Instructor) Royal Marines. 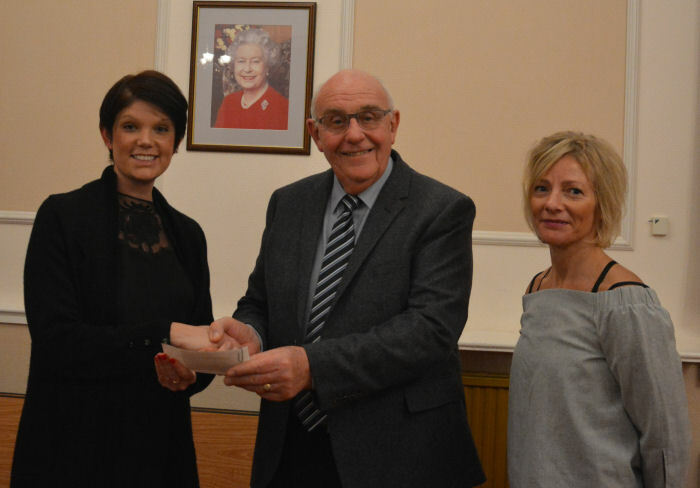 Exmouth and Lympstone Hospiscare were among 25 causes getting a donation from Masonic lodges across Devon. The charity was chosen as one of the causes the Freemasons of Devonshire will support. 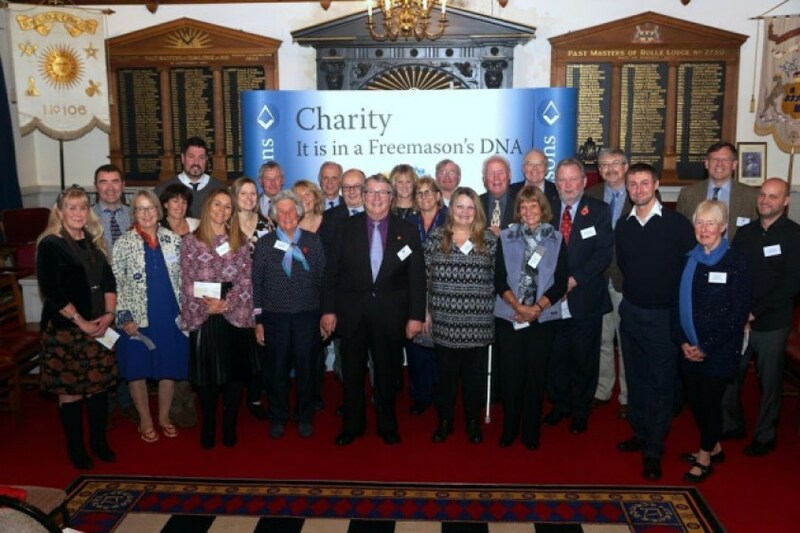 Twice a year the Devon Freemasons pick 25 causes to donate cash to from its ‘Wake Fund’. Cheques totalling £25,000 were presented to each of the 25 representatives in the name of the sponsoring Lodges. 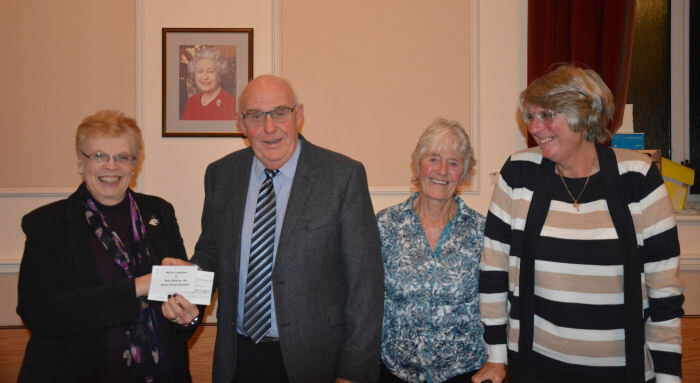 All the organisations were presented with their cheques at a special evening held at the Exmouth Masonic Hall in St Andrew’s Road by Provincial Grand Master for the Freemasons of Devonshire Ian Kingsbury. 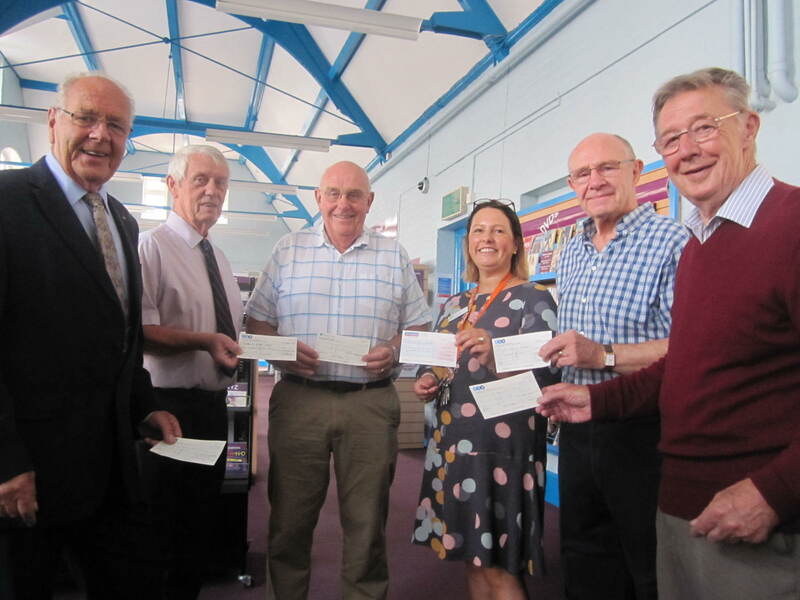 Among those who given money were Friends of Exmouth Libraries (nominated by The Rolle Lodge No. 2759) and Exmouth and Lympstone Hospiscare (nominated by The Sun Lodge No. 106). 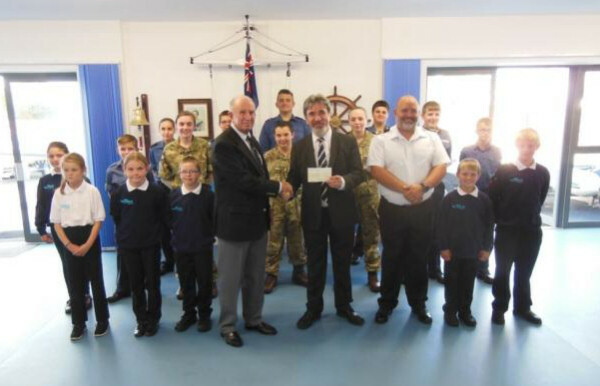 The cheque for £2,000 brings the total given to the cadets during the last few years to £4,250, and will help with the cadets’ final payments towards the cost of their new headquarters.